2017 In A Sentence: The Cougars finished an up and down season at 7–4, having signature wins over Arizona and South Florida, but having suffered inexplicable losses to Tulsa and Tulane and ended the season with a Hawai’i Bowl loss t Fresno State Bulldogs, 33–27. Biggest Shoes to Fill: RB Duke Catalon, who led Houston in rushing the past two seasons, has left the team for personal reasons. He rushed for 1,165 yards and 12 touchdowns in his two seasons at UH. He also added 367 receiving yards and four touchdowns. Key Player: DT Ed Oliver had 16.5 tackles for loss and 5.5 sacks, pretty much unheard-of disruption for a 3-4 lineman. The now-junior also recorded 73 tackles and has been named to just about all the major All-American squads after last year and in this preseason. He is also a surefire first round NFL pick if all goes well this year. Fearless Prediction: The Cougars have all the ingredients to make a surge in the AAC West and very well could surpass last year’s seven-win total. 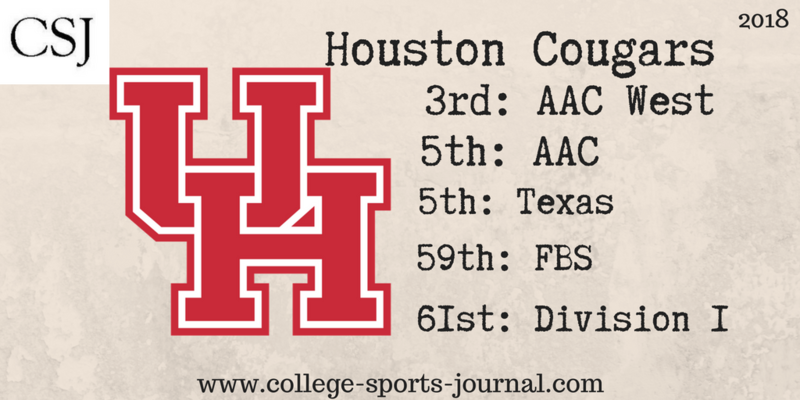 Another bowl game at least is a certainty for Houston but very well could find itself in the AAC title game if all plays out in the close games, which they lost four of last year.